In Part 1 of the Voki Classroom announcement, we introduced you to Voki’s classroom management system. We received some great feedback and we’d like to share more about Voki Classroom. In Part 2, we’re going to tell you more about some of the additional features you’ll have access to with Voki Classroom. Manage Classes & Assignments. Voki Classroom lets you add and manage your Classes, as well as Aassignments within each class. When you add a new class, a new row will appear (see below). You can then name your Class – i.e. “Spanish (first period)” and add Assignments to it. To add an Assignment, simply click on the Notepad+ icon next tot he class name. Then, give your Assignment a name, and add a description. You can also customize the layout and coloring of each Assignment by clicking on the Configure icon. Each Assignment comes with an Assignment Page – a Web page where you can feature all of the approved Vokis created for that Assignment. Or, if you prefer, you can set the Assignment Page to Private and require a password to view it. If you have your own class site, you can still easily embed each Voki using the embed code. Review Student Work. Review and approve your students’ Vokis within your Voki Classroom account, all in one page. 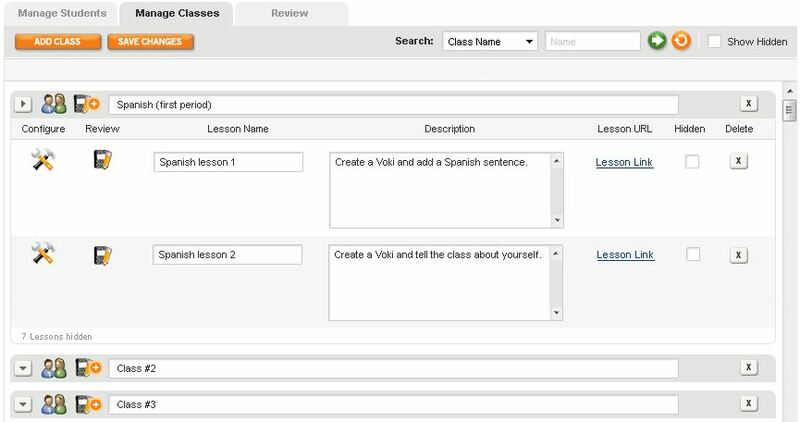 You can view all students Vokis for a given Assignment (view “By Assignment”), or look up and review all Vokis created by an individual student (view “By Student”). You can also choose to view only incomplete, completed or un-reviewed Vokis. Clicking the Preview icon (the little person button) will open a new window with the Voki scene. If approved, just click the Approve icon (green check mark), and the Voki will appear on the Assignment Page. To get the code, click on the Code icom (<>). That’s all for Part 2 of our introduction to Voki Classroom. As always, we’re eager to get your thoughts – comments or questions – about Voki Classroom. Feel free to leave a comment below! I am planning to start my classrooms voki as soon as possible for my Indonesian class. How do I go about registering for it and is there a free trial? where do my students log on with their id so that that voki will be saved in the proper place. I’m not finding that information. please help. …they will log in on the Voki Classroom login page: https://voki.com/classroom.